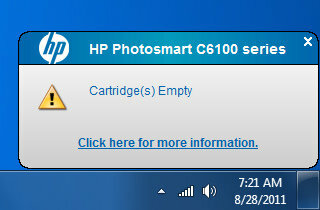 I start up my computer and get a warning that my printer has one or more empty ink cartridges. I click the link for more information. 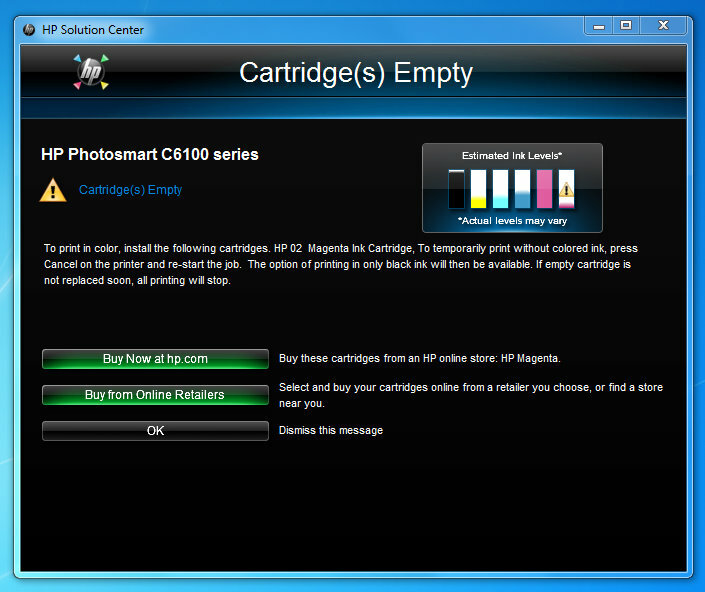 A "Cartridge(s) Empty" window opens and tells me that the magenta cartridge needs replacing. I've never purchased ink direct from HP before. Thinking that, just maybe, they have an integrated system that supports quickly ordering replacements for empty or low ink cartridges, I click the "Buy Now at hp.com" button. Rather than take me direct to an option to purchase the one cartridge I need, it asks me what printer I have. I would have thought that transferring my printer information to the HP online printer supply store, SureSupply, would have been a feature included in the over 300 megabytes of HP software added to my computer when I installed the printer drivers. So, what kind of printer do I have? I know what ink I need, but I don't remember the printer model number. The ink is "HP 02". That is easy to remember. The name and number of the printer isn't so easy to remember. 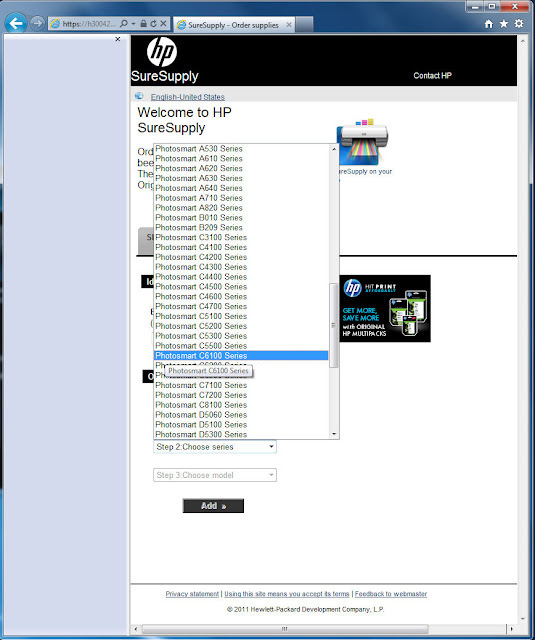 Since the software that warned I am out of ink still shows "HP Photosmart C6100 series" on my screen, I am able to make the required selections from the first two drop-down lists. However, I still don't know the exact model. I have to get up from my desk and go look at the printer to get the model number. 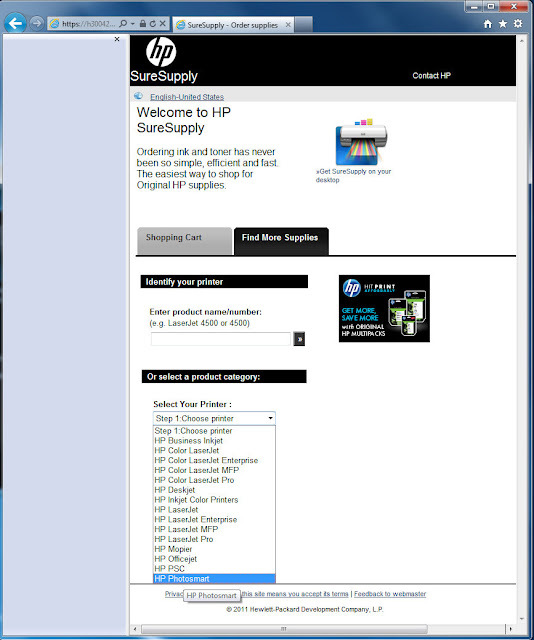 So far, this isn't looking like the "easiest way to shop for Original HP supplies". Am I expecting too much to think the software on my computer could tell the online store what ink I need, or what printer I have? Am I expecting too much to think I should be able to select ink by the ink type?